Automated drawing of single-line schemes of street lighting feeders. The program has a calculation process, which is open to monitoring. Every step of all the electrical calculations (including interim and auxiliary results) can be thoroughly checked on the user's request. The built-in help system contains detailed descriptions of all calculation procedures and recommendations for the selection of protective devices in street lighting feeders. The following specifications are available: street lighting poles, pole foundations, luminaries, power cables, cable tracks, earthing devices, electrical equipment and internal wiring. External reports with results of specifications and explications can be exported to an external spreadsheet application. The MeteorCalc SL enables you to create street lighting network models of any level of complexity. There are no restrictions in the quantity of branches in street lighting feeders. The drawing of accurate and detailed schemes of street lighting feeders is very simple with the MeteorCalc SL. Single-line schemes will be drawn automatically from a feeder start point to each selected endpoint. There is a built-in database of cables used in the networks of street lighting. We permanently expand the cable database and we’ll add new cable types according to customer requests. A customizable Data Library for street lighting units (with luminaires, street lighting poles and foundations) is intended for repeated use in your projects. MeteorCalc SL has localized versions for different regions, because there are different types of power cables and different electrotechnical calculation settings in various countries. Just tell us where you are from, and we will make and provide a corresponding regional version to you. MeteorCalc SL supports the 230/400V (TN) 50Hz voltage systems in street lighting networks and the Metric system of units in dwg-files. The nominal voltage is adjustable within 220/380V - 250/440V according to regional standards. 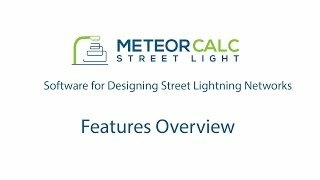 MeteorCalc SL will help you to create high quality street lighting projects, including accurate schemes, precise specifications and detailed descriptions of equipment. The complex of electrical calculations carried out by MeteorCalc SL allows you to design safe electrical installations. The productivity of outdoor lighting designers increases several times when using this plugin. The fully functional 30 days trial version of MeteorCalc SL has only one restriction: the number of street lighting unit blocks in a dwg-file should not exceed 50 pcs. To start, we recommend you to refer to the Getting Started (Beginners Guide) brochure and use the MeteorCalc_SL_Example_1_Street_Lighting.dwg file. This step by step example is adapted for the trial version.